Halloween Costume Contest - $50 GC Up for Grabs! Come in for Trick or Treating for young and young at heart alike! Best costume wins $50 gift certificate for in house products. Facebook Live Drawing of Raffle Winners! 3.) 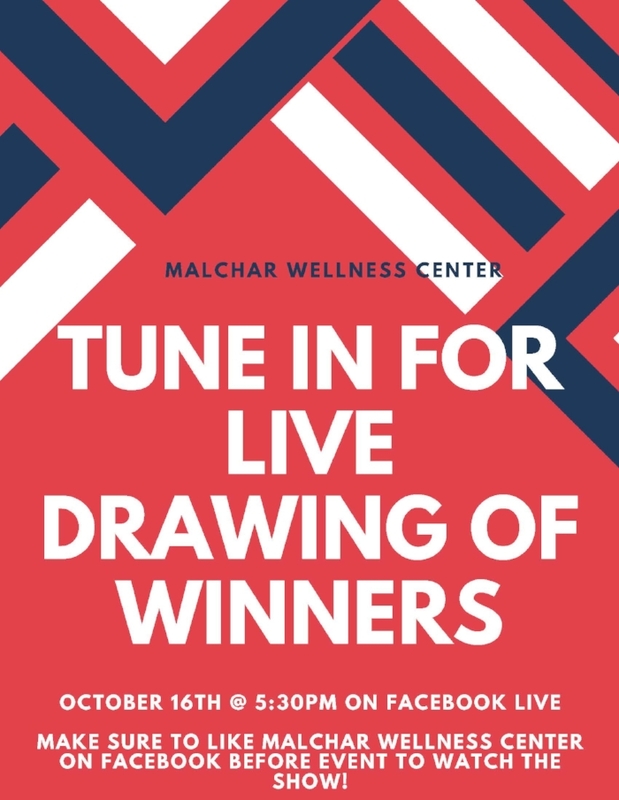 Watch for notification on your Facebook app on 10/16 @ 5:30 pm for Malchar Wellness Center to have a live feed starting. 4.) Click notification and watch LIVE as we announce winners! Come meet our new Nutritional Counselor Alison and talk to her about how FirstLine Therapy Nutritional Program can help you make a lifestyle change. Learn about functional medicine, try out recipes from Mediterranean and Keto diets, fill out a complementary evaluation form, and enter to win 12 weeks of nutritional counseling for free! Come meet our new Nutritional Counselor Alison and talk to her about how the FirstLine Therapy Nutritional Program can help you make a lifestyle change. Learn about functional medicine, try out recipes from Mediterranean and Keto diets, fill out a complementary evaluation form, and enter to win 12 weeks of nutritional counseling for free! Join us for food, raffles, and fun this week while we introduce you to our good news! Learn about new programs, FirstLine Therapy, the Malchar Movement, and more. Our office will be closed for training implementation. Thank you for your understanding. Our office will be closed from Sept 6th - Sept 11th for out of office training. Thank you for your understanding!